About 1,5 years ago I was walking down Market Street with a huge grin on my face. I was highly amused listening to an episode of Mystery Show in which pencil sharpener David explained that he was on a mission to find out Jake Gyllenhaal’s true height. Struck by the fact that a guy would ever wonder about such a thing, I was eager to find out how this story would evolve. A few weeks before this highly entertaining experience, however, I had hardly heard of podcasts let alone listened to one. Gimlet Media. Who? Little did I know this podcast company would become my go-to podcast during hours and hours of daily commutes, bike rides and walks in the park, giving me a warm welcome to the world of podcasts with its amazing shows. In early 2015 I was in San Francisco for business. The tip to listen to podcasts came from a friend who said she listened to podcasts on her way to work. As I hadn’t heard anyone talk about podcasts before, I asked her which podcasts she listened to. “Serial” she said, “and Startup”. She emphasized how she was convinced I would enjoy listening to especially the latter (as I was running a startup at the time and there was a lot to relate to), yet when we said goodbye I soon forgot about her encouragement to download the show. A few days later, I met another friend who spontaneously started talking about Startup and described it as “a really cool podcast where you learn how to start your company”. I thought it couldn’t be a coincidence that two people referred me to the same podcast in the same week and spoke so enthusiastically about it. Startup didn’t disappoint, and neither did any of the other shows Gimlet launched thereafter. Gimlet Media has an entertainment factor that is unheard of. Never has a podcast company succeeded in keeping me entertained for so long. That´s because I easily identify with the stories being told in the different shows, which are about real people talking about real life. And real life is an emotional rollercoaster. Just like the people in Gimlet’s shows, I’ve felt highs and lows throughout the many hours spent listening to Gimlet. For example, on the highs, I’ve laughed out loud (when Alex asked his wife what she thought of the name ‘Orello’ as a company name), felt encouragement (when a 12 year old asked grown ups for advice on how to wear her trapper keeper the cool way), and great curiosity (listening to reporter Rukmini Callimachi explaining how ISIS talks on the internet). But I’ve also felt embarrassment (for example during that moment when Alex first pitched to Chris Sacca) and sadness (when Lauren and Emma from Dating Ring were having such a hard time making their company work, or when Justin and the team from Justin.tv realize their idea isn’t working). Besides a great dose of entertainment, Gimlet is amazing in telling great stories. All of Gimlet’s hosts are great at doing so, yet my favorite story teller must be Starlee Kine, Mystery Show’s host. When she announced she was going to solve the world’s mysteries, I knew she meant business. Besides her mission to hunt down Jake Gyllenhaal, the hassle she went through to solve Britney Spear’s book mystery was at least as impressive. My favourite Gimlet story in Gimlet history, however, must be the lost & found story on the belt buckle. I’ll never forget that moment Starlee handed over the belt buckle to Bob who was so thankful to her for getting it back. Alex’s recent announcement that there will be no second season of Mystery Show is saddening, yet I know that Gimlet will come up with other great shows. Speaking of which, it’s newest show Heavyweight hosted by Jonathan Goldstein is one of those new jewels that already belongs to my favourites. Last, there are some great things to learn from all of its shows. Startup has taught me that behind-the-scenes startup life is chaos wherever you go. Through Reply All I’ve come to know all about vlogging raids in the gaming world, and a famous dog with 2mln Instagram followers. Sampler introduced me to a podcast called ‘Window to the magic‘ in which host Paul Barrie gives weekly trips to Disney World (it’s a fascinating thing). Surprisingly Awesome´s Circle of Fifths episode taught me about one of the fundamental concepts from music theory, and from Science VS I’ve learned that it´s worth thinking twice buying organic vegetables. Last, Heavyweight has made me think about those moments from the past where I should have approached things differently. All of these great things I learn while killing time I otherwise would have spent being bored. New to Gimlet? Then you’ve come to the right place. Ease into the shows with one of the aforementioned episodes from Reply All where you’ll hear relatively short episodes about the internet that cover a wide range of topics. PJ and Alex, the show’s hosts, will generally interview different people who give their opinion on the issue in question. Once you’re ready to dive into Gimlet a bit deeper, then both Mystery Show and Heavyweight provide longer (~40 min- 1 hour) episodes where the hosts really tell a story. Particularly into the startup scene? Then listen to Startup, where Alex and Lisa will discuss the highs and lows of setting up a company. If you enjoy hearing practical startup tips, check out Open for Business, a podcast co-branded together with eBay. Surprisingly Awesome and Science VS both take a topic and break it down to determine whether it’s interesting (the former), or whether you should believe the myths (the latter). These shows are great for people who want to get a good understanding about a theme. Last, if you’re particularly looking to discover other podcasts, Sampler goes through various podcast snippets with a different guest per episode. Even after having discovered plently of other podcast shows, this podcast company has always remained in my top 3 with one show or another. 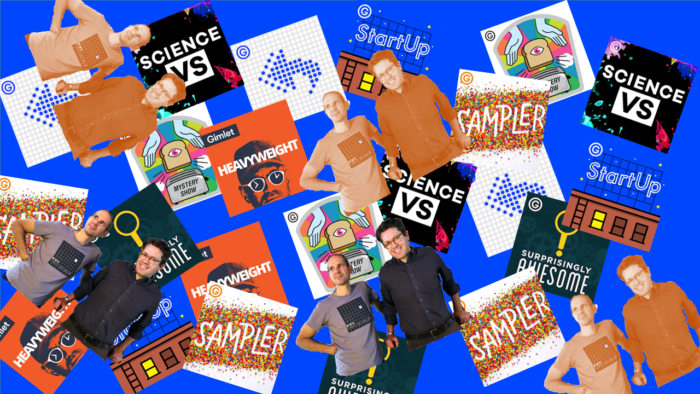 Gimlet simply creates some of the best podcast content out there, and so much more. Gimlet, you don’t know how many times you’ve made my day.